Countries across Asia have been amending their transfer pricing legislation to come into alignment with the OECD/G20 Action Plan for Tax Base Erosion and Profit Transfer Projects – or the BEPS Action Plan – since it was unveiled in 2015. China and the Hong Kong Special Administrative Region are no exceptions to this trend. 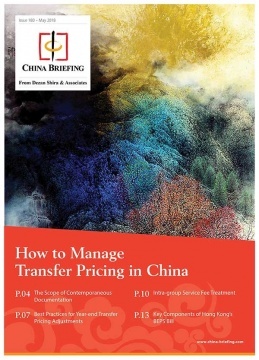 In this issue of China Briefing magazine, we offer foreign investors a practical guide to navigating the new transfer pricing regime in China as well as an introduction to major changes happening in Hong Kong. We begin by examining the scope of contemporaneous documentation needed when preparing related party tax files in China. New transfer pricing document disclosure requirements have increased compliance demands on enterprises, opening the door for more documentation mistakes to be made in the process. Next, we consider some best practices for making year-end transfer pricing adjustments, before analyzing the regulatory treatment of intra-group service fees. China has more stringent requirements in certain areas of transfer pricing compared to OECD countries, making a deep understanding of shareholder activities and strong internal controls all the more important. Finally, we introduce the key provisions of Hong Kong’s new BEPS Bill, which is set to be enacted in the coming months. The new bill is a milestone in the development of Hong Kong’s transfer pricing enforcement regime, and is more comprehensive than most observers anticipated.